Jupiter has recently changed signs from Scorpio to Sagittarius, which is Jupiter’s own sign. On Nov. 14, 2018, Jupiter opposed 54598 Bienor, one of the notable centaurs, currently retrograding in the first degree of Gemini. 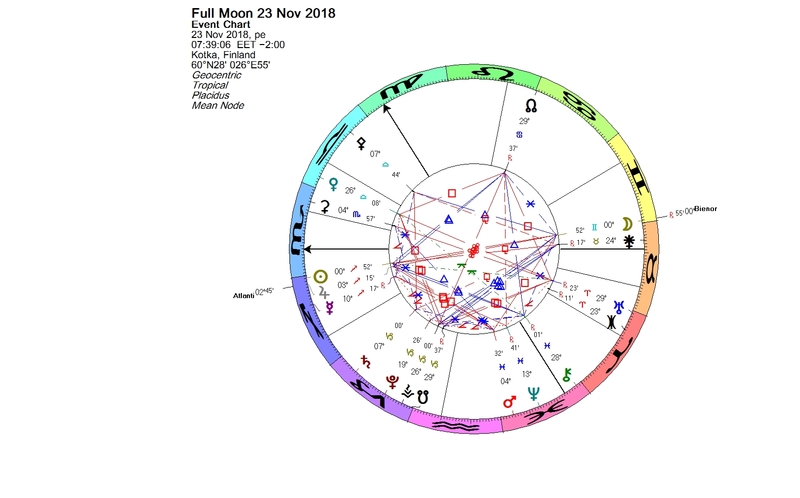 On Nov. 17, Mars in Pisces made a square to Bienor, and the Gemini Full Moon of Nov. 23, 2018, conjoined Bienor. The Sun in Sagittarius is in conjunction with Jupiter. Mercury, the ruler of Gemini, is retrograding. Centaurs are minor planets that orbit the Sun between Jupiter and Neptune and cross the orbits of one or more of the giant planets. However, different organizations are using different criteria for them, and that is why the exact number of centaurs is difficult to say. The JPL Small-Body Database lists currently around 450 centaurs. Anyway, their number is much lesser than that of the thousands of trans-Neptunian objects. The sizes of centaurs range from a few tens of kilometers to a few hundreds of kilometers across. 54598 Bienor is one of the bigger ones (dimensions 207 +/- 30 km). Bienor grazes the orbit of Uranus, and has an orbital period of about 67 years. It will reach perihelion (the point in its orbit where it is nearest to the Sun) in January 2028. Some centaurs behave like comets, displaying comas. Some seem to have a ring formation around them. 10199 Chariklo, the largest centaur, is known to have a pair of narrow rings. Also 2060 Chiron, the first-identified member of the centaur class (discovered in 1977) possibly has a ring system. There has been speculation about 54598 Bienor having an icy ring around it, too. 54598 Bienor was discovered in 2000 and named after one of the mythical centaurs who tried to kidnap the bride Hippodame and other women at the wedding of the Lapith king Pirithous. Many centaurs died in the battle which followed, but Bienor’s death was unique. Pirithous’ friend Theseus leaped upon the back of Bienor, who was never trained to carry riders, and smashed his head. According to Robert von Heeren’s site “The Centaur Research Project”, Bienor’s name means “the man of the power / force”. Eric Francis has proposed that Bienor may be associated with the strength of mankind expressed through technology. It is up to us whether to put our strength to work for us, or against us. In the Gemini Full Moon chart asteroid 1198 Atlantis is in Sagittarius in conjunction with the Sun and Jupiter, and opposite the Moon and 54598 Bienor. The asteroid was named after the mythological island of Atlantis, which the gods sent to sink into the sea, because human society had become greedy and morally corrupt. In astrology 1198 Atlantis addresses the use and misuse of technology, and the sense of imminent doom. By the way, Marshall McLuhan is known for predicting the World Wide Web almost 30 years before it was invented. The current opposition of 54598 Bienor and 1198 Atlantis in the Full Moon chart suggests that we may have to deal with some of these issues now. May 6, 1949 (Sun conjunct Bienor) – EDSAC (Electronic Delay Storage Automatic Calculator), an early British computer ran its first programs. It was the first practical stored-program electronic computer. OXO, a version of “noughts and crosses” for the EDSAC was developed in 1952. It may well have been the world’s first video game. Nov. 22, 1977 (Sun conjunct Bienor) — TCP/IP test succeeds connecting 3 ARPANET nodes (of 111), in what eventually becomes the Internet protocol. –	Tim Bray (born June 21, 1955) is a Canadian software developer and entrepreneur and one of the co-authors of the original XML specification. –	Nigel Findley (July 22, 1959 – Feb. 19, 1995) was an American game designer, editor, and an author of science fiction and fantasy novels and role-playing games (RPGs). –	Jukka Tapanimäki (Aug. 11, 1961 – May 1, 2000) was a Finnish game programmer. Tapanimäki wrote his games for the Commodore 64 computer. Tapanimäki was a reviewer for MikroBitti and “C” computer magazines; and a freelance writer of advanced-level computer programming articles. –	Hideo Kojima (born Aug. 24, 1963) is a Japanese video game designer, screenwriter, director and game producer. In 2005, Kojima founded Kojima Productions, a software house controlled by Konami, and by 2011 he rose as vice president of Konami Digital Entertainment. In 2015, Kojima Productions split from Konami, becoming an independent software company. –	Jack Dorsey (born Nov. 19, 1976) is an American computer programmer and Internet entrepreneur who is co-founder and CEO of Twitter, and founder and CEO of Square, a mobile payments company. –	May 11, 1950 — The Kefauver Committee hearings began in the USA. The committee investigated organized crime across the state borders. Hearings were held in 14 major cities and more than 600 witnesses testified. Many of the committee’s hearings were shown live on national television to large audiences. Many Americans had their first glimpse of organized crime’s influence in the U.S. The Kefauver Committee’s work led to expanding civil law to combat organized crime. –	June 2, 1953 – Coronation of Queen Elizabeth II of the United Kingdom at Westminster Abbey was the first British coronation to be televised and was also the world’s first major international event to be broadcast on television. –	May 19, 2018 – The wedding of Prince Harry and Meghan Markle is held at St George’s Chapel, England, with an estimated global audience of 1.9 billion. The wedding was also streamed live online on YouTube via the British Monarchy’s official The Royal Channel. July 6, 1957 (Sun conjunct Bienor) — John Lennon and Paul McCartney meet for the very first time, as teenagers at Woolton Fete, 3 years before forming the Beatles, the most commercially successful band in the history of popular music. –	John Lennon (Oct. 9, 1940 – Dec. 8, 1980) has a natal Bienor-Typhon conjunction at the Aries Point, opposite his Mars. –	July 12, 1958 (Sun conjunct Bienor) — The Beatles, at this time known as The Quarrymen, pay 17 shillings and 6 pence to have their first recording session. –	The first live, international, satellite television production, broadcast on June 25, 1967, is mostly remembered because of the Beatles. The event was Our World with an estimated 350 million viewers and had the largest television audience ever up to that date Ten thousand technicians, producers and interpreters took part in the broadcast. The Beatles topped the event with their debut performance of “All You Need Is Love”. Released a week later, during the Summer of Love, the song was adopted as a flower power anthem. Transiting Bienor in Virgo was in conjunction with Lennon’s natal Neptune and trining his natal Uranus. As an interesting reference, Canada’s CBC Television had Marshall McLuhan being interviewed in a Toronto television control room in the beginning of the show. –	Dec. 8, 1980 (Sun conjunct Bienor) — John Lennon is murdered in New York City. May 13, 1950 (Sun conjunct Bienor) — the first race in the inaugural FIA Formula One World Championship was held at Silverstone, England. –	Mika Häkkinen (born Sept. 28, 1968), nicknamed “the Flying Finn“, is a Finnish former professional racing driver. He was the 1998 and 1999 Formula One World Champion, driving for McLaren and has been ranked among the greatest Formula One drivers in various motorsport polls. Mika Häkkinen has the Sun-Bienor conjunction in his natal chart. –	May 14, 1950 (Sun conjunct Bienor) — The Huntsville Times runs the headline “Dr. von Braun Says Rocket Flights Possible to Moon”. That might have marked the beginning of those efforts. Wernher von Braun was a German, later American, aerospace engineer, who developed the rockets that launched the U.S.’ first space satellite Explorer I, and the Saturn V rocket, that enabled manned lunar landings. –	July 20, 1969 (Moon conjunct Bienor) – The first lunar landing was seen by more than 700 million people on television (a new record at the time). Apollo 11 was the flight that took the first humans there. The Moon was in early degrees of Libra in a tight conjunction with Bienor (opposing the Aries Point), mirroring two things: the strong men who bravely set out for the Moon; and the strong feelings involved in this event, not just in the USA but worldwide. Jupiter and Uranus were in conjunction in Libra, exactly opposite the Aries Point. The experience was not just historical for the mankind, but also highly personal for the men who walked on the Moon. –	Nov. 3, 1973 (Sun conjunct Bienor) – NASA launches Mariner 10 toward Mercury (on March 29, 1974 it becomes the first space probe to reach that planet). Aug. 28, 1963 — Martin Luther King, Jr. delivers his I Have A Dream speech on the steps of the Lincoln Memorial to an audience of at least 250,000, during the March on Washington for Jobs and Freedom. The speech was a defining moment of the civil rights movement. Afterwards a recording of King’s Cobo Hall speech (from June 1963), in which King had delivered “I have a dream” refrains, was released by Detroit’s Gordy Records as an LP entitled “The Great March To Freedom”. Nov. 28, 1977 – Jazz saxophonist Archie Shepp records “On Green Dolphin Street”, the first digitally recorded album to be released commercially in the USA. Dec. 28, 1984 – A Soviet cruise missile plunges into Inarinjärvi Lake in Finnish Lapland. Finnish authorities announce the fact to the public in January 1985. The Soviet authorities describe it as an old, unarmed Soviet cruise missile being used for target practice. Jan. 15, 1990 — Martin Luther King Day Crash – Telephone service in Atlanta, St. Louis, and Detroit, including 9-1-1 service, goes down for nine hours, due to an AT&T software bug. Jan. 26, 1992 — Boris Yeltsin announces that Russia will stop targeting cities of the United States and her allies with nuclear weapons. In return President George H. W. Bush announces that the United States and her allies will stop targeting Russia and the remaining communist states with nuclear weapons. Feb. 9, 1996 — The element copernicium is created in Germany. Copernicium is a synthetic chemical element with symbol Cn and atomic number 112. It is an extremely radioactive element, and can only be created in a laboratory. It is named after the astronomer Nicolaus Copernicus. May 12, 2017 — Computers around the world are hit by a large-scale ransomware cyberattack, which goes on to affect at least 150 countries. This entry was posted on Saturday, November 24th, 2018 at 7:22 pm	and is filed under Full Moon. You can follow any responses to this entry through the RSS 2.0 feed. You can leave a response, or trackback from your own site.